An accessible social history of the U.S. 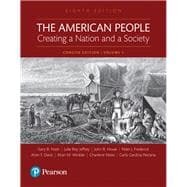 The American People: Creating a Nation and a Society, Concise Edition examines U.S. history as revealed through the experiences of diverse Americans, both ordinary and extraordinary. With a thought-provoking and rich presentation, the authors explore the complex lives of Americans of all national origins and cultural backgrounds, at all levels of society, and in all regions of the country. Retaining the hallmark accessible narrative and eloquent prose of previous editions, the Eighth Edition offers new and updated content that engages students and ensures an up-to-date learning experience. Gary B. Nash received his Ph.D. from Princeton University. He is currently Director of the National Center for History in the Schools at the University of California, Los Angeles, where he teaches colonial and revolutionary American history. A former president of the Organization of American Historians, his scholarship is especially concerned with the role of common people in the making of history. Julie Roy Jeffrey earned her Ph.D. in history from Rice University. Since then she has taught at Goucher College. Honored as an outstanding teacher, Jeffrey has been involved in faculty development activities and curriculum evaluation. She was Fullbright Chair in American Studies at the University of Southern Denmark, 1999—2000 and John Adams Chair of American History at the University of Utrecht, The Netherlands, 2006. She is the author of many articles on the lives and perceptions of nineteenth-century women. Her recent research interest focuses on subversion during the Civil War. John R. Howe received his Ph.D. from Yale University. At the University of Minnesota, he has taught the U.S. history survey and courses on the American revolutionary era and the early republic. His present research deals with the social politics of verbal discourse in late eighteenth- and early nineteenth-century Boston. He has received a Woodrow Wilson Graduate Fellowship, a John Simon Guggenheim Fellowship, and a Research Fellowship from the Charles Warren Center for Studies in American History. Peter J. Frederick received his Ph.D. in history from the University of California, Berkeley. His career of innovative teaching began at California State University, Hayward, in the 1960s and continued at Wabash College (1970-2004) and Carleton College (1992-1994) He also served as distinguished Professor of American History and Culture at Heritage University on the Yakama Nation reservation in Washington between 2004 and 2006. Recognized nationally as a distinguished teacher and for his many articles and workshops on teaching and learning, Frederick was awarded the Eugene Asher Award for Excellence in Teaching by the AHA in 2000. Allen F. Davis earned his Ph.D. from the University of Wisconsin. A former president of the American Studies Association, he is a professor emeritus at Temple University and editor of Conflict and Consensus in American History (ninth edition, 1997). Allan M. Winkler received his Ph.D. from Yale University. He has taught at Yale and the University of Oregon, and he is now Distinguished Professor of History at Miami University of Ohio. An award-winning teacher, he has also published extensively about the recent past. His research centers on the connections between public policy and popular mood in modern history. Charlene Mires earned her Ph.D. in history at Temple University. At Rutgers University-Camden, she teaches courses in public history, urban history, and material culture, and serves as director of the Mid-Atlantic Regional Center for the Humanities. She is the author of Independence Hall in American Memory (2002), Capital of the World: The Race to Host the United Nations (NYU Press, 2013), and editor-in-chief of The Encyclopedia of Greater Philadelphia (a digital work in progress). A former journalist, she was a co-recipient of the Pulitzer Prize for general local news reporting with other staff members of the Fort Wayne (Indiana) News-Sentinel. Carla Gardina Pestana received her Ph.D. from the University of California at Los Angeles. She is Professor and Joyce Appleby Chair of America and the World at UCLA. She has authored books and articles on 17th and 18th century religion, politics and empire.